Do ecclesiological differences matter? 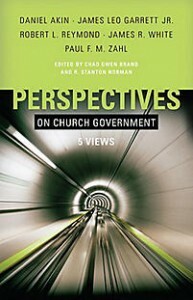 The editors of Perspectives on Church Government: 5 Views (Chad Owen Brand and R. Stanton Norman) believe they do. These editors have assembled five essayists, each representing different forms of polity – Daniel Akin (single elder-led congregational model), James Leo Garrett Jr. (democratic congregational model), Robert L. Reymond (Presbyterian model), James R. White (plural elder-led congregational model), and Paul F. M. Zahl (Episcopal model). After the editors present an overview of the historical development of church polity, they introduce five writers who make a case for their particular forms of polity. Daniel Akin makes the case for a single elder-led church. First, he builds a foundation by laying out the biblical evidence for congregationalism. Then, he shows the Scriptural description of elders, who they are and what they are to do. Akin makes the case for a “pastor teacher” who functions as “first among equals” if there is a plurality of elders or a single pastor who leads the congregation. The purpose of Akin’s essay is not to demand every church be led by a single elder, but instead to make the case that the New Testament allows for flexibility in the number of elders. Because of this belief, he does not give space to biblical exegesis or analysis of relevant texts. Instead he gives a brief historical overview of Anglicanism, explains the episcopacy, and then highlights its strengths and weaknesses. James R. White presents the plural-elder-led church, a polity distinct from the two other forms of congregationalism in that White believes a plurality of elders is essential. It appears also that, for White, these elders have more authority than in a strictly democratic variation of congregationalism. Three out of the five essays in this volume are from a congregational perspective. Because of this, many of the same pieces of evidence are repeated throughout the book. Still, it is interesting to note the different ways the congregational writers go about making their case. Personally, I find the strongest evidence for congregational government in the New Testament’s description of the church as the final court of appeal in the exercise of church discipline and the implying of a church vote. In other cases, the biblical evidence for congregationalism is less convincing, especially in Acts. For example, I do not find it persuasive to take the description of Barnabas being sent by a church in Acts 11:22 or his giving a report to the congregation (14:27) as evidence for congregational church government (as Akin does). This is a common theme throughout the book, not just in Akin’s essay: the authors turn to texts that may hint in one direction or another but are not in any way forceful or explicit on the subject of church polity. Perhaps the greatest example of trying to discern a definitive statement on church polity in a passage that contains mere hints and clues is Robert Reymond’s essay, in which the elaborate system of presbyteries, sessions, and elders is grounded almost exclusively in Acts 15. Reymond’s attempts to extrapolate a Presbyterian polity from this event are passionate, but they suffer from the same weakness as Akin’s marshaling of descriptive texts as evidence for congregationalism. To read Presbyterian polity back into a text like Acts 15 is anachronistic, something the other contributors are quick to point out. Perspectives on Church Government gives a helpful overview to different forms of church polity. A reader who is looking for a succinct, biblically informed, historically mindful presentation of church government will find this book to be an important resource. The writers are charitable and gracious in their interactions, even when they disagree strongly regarding their differing views. Readers may not walk away convinced of any one perspective, but they will likely grow in their appreciation for other points of view and the passion with which people advocate for them.